Caden has entered the everything-is-awesome LEGO phase of childhood play! Having grown up with LEGOs myself, I have to say that I LOVE it! We recently inherited a huge trunk full of all my brother’s LEGOs and we are in LEGO heaven! He is building something new everyday! 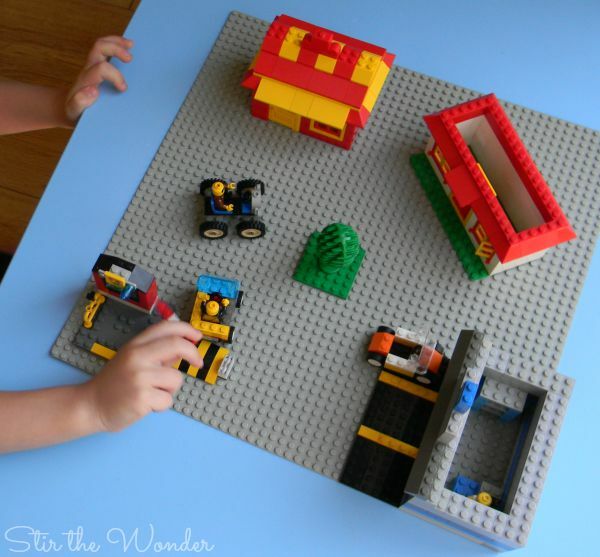 LEGOs are a great way for kids to work on fine motor skills and are invaluable for learning math concepts. Last week I started building a LEGO Town Small World for him to play with and use his imagination. It’s pretty simple, but he loved playing with it anyway! To create this LEGO Town Small World I used a large gray base plate and basic bricks, most of these are almost vintage, so I can’t really link to any specific set. The great thing about LEGOs is that you can build almost anything with any of the bricks, so you don’t really need specific sets, just a little creativity and imagination! I started creating this LEGO Town Small World by building a little house. I built it on a small green base plate, and use white bricks to the walls, added a door and two windows. I used some red sloped bricks for the roof, but left the top open so Caden could easily put some mini figures inside. Then I built a little store using gray and blue bricks. I added a parking lot using a small black base plate and flat yellow pieces for the parking lines. The other building I created, started out as a little red schoolhouse, but ended up looking more like a fast food restaurant, complete with a drive-thu window! Caden had the most fun with this LEGO building! He loved driving his little LEGO cars to the window to place an order! As you can see our LEGO Town Small World is pretty simple. Caden started playing with it before I could add any other little details. He also started taking it apart… that’s his favorite thing to do with LEGOs. We just love LEGOs! They are an awesome toy to stretch ones imagination and creativity! What would you add to this simple little LEGO Town Small World? Check out some other amazing small world play set ups at Still Playing School’s Small Worlds from A to Z! This looks like so much fun! There is just something irresistible about Lego! We need to get some wheels for our Legos, that’s all there is too it! 😉 This is so great for pretend play!